In climate-responsive design the building becomes an intermediary in its own energy housekeeping, forming a link between the harvest of climate resources and low energy provision of comfort. Essential here is the employment of climate-responsive building elements, defined as structural and architectural elements in which the energy infrastructure is far-reaching integrated. This thesis presents the results of research conducted on what knowledge is needed in the early stages of the design process and how to transfer and transform that knowledge to the field of the architect in order for them to successfully implement the principles of climate-responsive design. The derived content, form and functional requirements provide the framework for a design decision support tool. These requirements were incorporated into a concept tool that has been presented to architects in the field, in order to gain their feedback. Climate-responsive design makes the complex task of designing even more complex. Architects are helped when sufficient information on the basics of climate-responsive design and its implications are provided as informative support during decision making in the early design stages of analysis and energy concept development. This informative support on climate-responsive design should address to different design styles in order to be useful to any type of architects. What is defined as comfortable has far-reaching implications for the way buildings are designed and how they operate. This in turn gives an indication of the energy used for maintaining a comfortable indoor environment. Comfort is not a strict situation, but subjective. Diversity is appreciated and comfort is improved when users have the ability to exert influence on their environment. Historically, the provision of comfort has led to the adoption of mechanical climate control systems that operate in many cases indifferent from the building space and mass and its environment. Climate-responsive design restores the context of local climate and environment as a design parameter. Many spatial, functional and comfort-related boundary conditions that have an effect on the energy design concept have been distinguished. There are many low-graded energy sources that can be put to use in the built environment, with local climate as the primary component. When exploring the potential of local climate, urban context needs to be taken into account since it heavily affects the actual potential. Since buildings are typically build to last for decades, consideration of changing climate and its expected effect on the energy potential is an important factor in the strategy to follow. The study of the energy potential of local climate resulted in a set of climate-related and context-related boundary conditions. The principles of climate-responsive design - the conceptual relations between energy source, energy treatment and comfort demand - can be translated into various design solutions, the contextual, architectural and technical implementation of these principles into an actual design. The design solutions can be divided into six categories- site planning, building form and layout, skin, structure, finish and (integrated)building service - that cover various dimensions in planning and construction. In this thesis a non-exhaustive list of design principles and solutions is presented using different matrices. 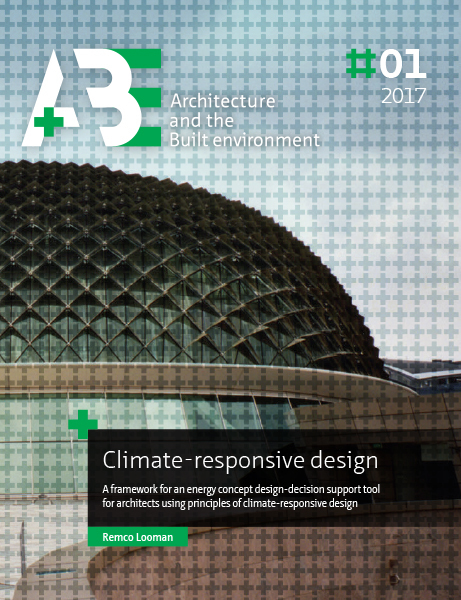 In order to design using climate-responsive design principles the architect should be given an overview of the comfort contribution and energy performance of design solutions. Furthermore, the identification of collaborations and conflicts when using multiple design principles together is essential. The generation of a satisfying design is more than just stacking solutions upon each other. It should also be made clear what a possible energy function of a building element is besides its primary function. This is where comfort and energy related design objectives of climate-responsive design meet other objectives (i.e. spatial, functional and structural). Finally, the impact of climatere sponsive building elements on the appearance of design is relevant to concept orientated architects. Together this can be considered as the content requirements of the design-decision support tool. In the early stages of the design process climate-responsive design is about the generation of energy concepts. In this phase accessible guidelines and the option to compare alternatives is more important than to assess absolute performance. The conceptual design phase is dynamic and has many iterations. Informative, context specific knowledge reduces the number of iterations before the architect has generated a satisfying number of design options from which it can continue to the next design phase of assessment. Functional requirements for the framework of the design decision support tool are the inclusion of a knowledge base with expert knowledge and best practice examples, the provision of informative, context-specific knowledge, the provision of accessible guidelines, the provision of an option to compare alternatives, the inclusion of the ability to inform during and assist in decision-making (i.e. intelligence) and the limitation of complexity and the generation of easy to interpret output. The tool is primarily developed for the architect so it needs to blend in the architect’s workflow enabling the architect’s creativity and guiding his intuition. Other form requirements of the design-decision support tool are the presence of customisation options and custom navigation patterns, all presented in a visual style. A concept of the web-based tool has been developed in order to illustrate what a climate-responsive design-decision support tool could look like. The heart of the tool is formed by the knowledge base, constructed from items grouped into one of four categories: principles, solutions, projects and guidelines. Relationships between items are incorporated within the knowledge base as hyperlinks, which makes it easy to navigate from one item to another. The stored information is presented in numerous ways. Info sheets provide the most detailed presentation style containing all available information for an item, while catalogues, matrices and a gallery provide quick overviews and reveal direct relationships with other items. In order to become a true design-decision support tool, the presented tool needs to be further developed. This includes the use of a more context-specific presentation style and the inclusion of more context-specific knowledge, the addition of layers in which the knowledge is presented varying from more general to practical, the development and implementation of performance indicators and a more direct and visual approach to pinpoint synergetic and conflicting effects. By using the tool, architects can access relevant knowledge in different ways that suit their method of working. It enables the presentation of complex relationships in a clear way and by doing so unlocking a much broader part of the content to them. That will help speeding up the process of design iteration before the energy concept can be assessed in the successive phase of the design process.